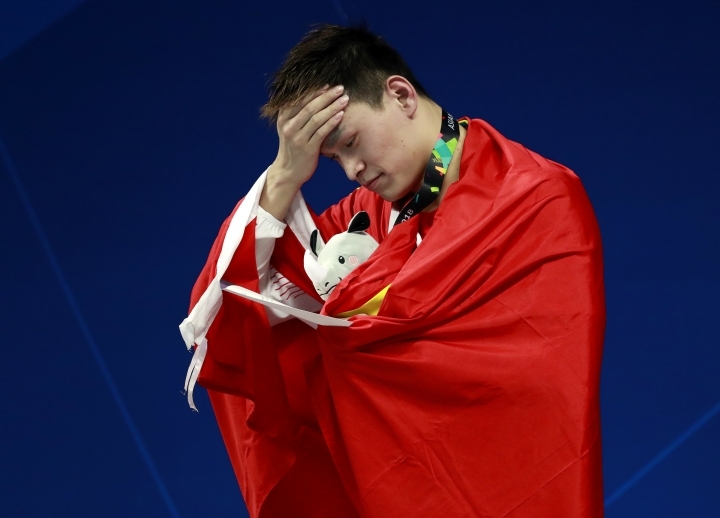 JAKARTA, Indonesia — Sun Yang won his second gold medal in as many nights at the Asian Games and this time he was rewarded with the raising of a red flag. It was the Chinese flag at his medal ceremony, much to the satisfaction of the three-time Olympic champion. Sun set an Asian Games record to win the 800-meter freestyle in 7 minutes, 48.36 seconds on Monday, staying on course in his quest for gold medals in every freestyle event from the 200 to the 1,500-meters in Jakarta. He kicked it off with an emotional victory in the 200 — he took silvers in that event in the 2010 and 2014 editions — on Sunday night, when the hoist broke during the medal ceremony and the flags crashed to the floor. Sun demanded that the ceremony start over but the glitch couldn't be properly fixed and the Chinese flag had to be held up by an honor guard rather than hoisted toward the roof of the stadium. There was no repeat after Sun had beaten Shogo Takeda of Japan by nearly five seconds in the 800. "It's really nice. It is my first Asian Games gold medal in 800," Sun said. "It's the big games you only have it once in four years — It's an opportunity that I want to cherish." 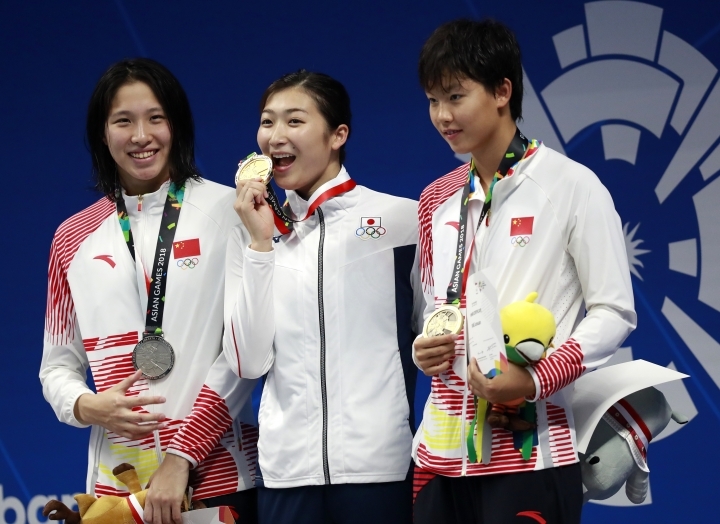 The rivalry between China and Japan in the pool is intense, and the countries had seven swimming gold medals apiece after two days. 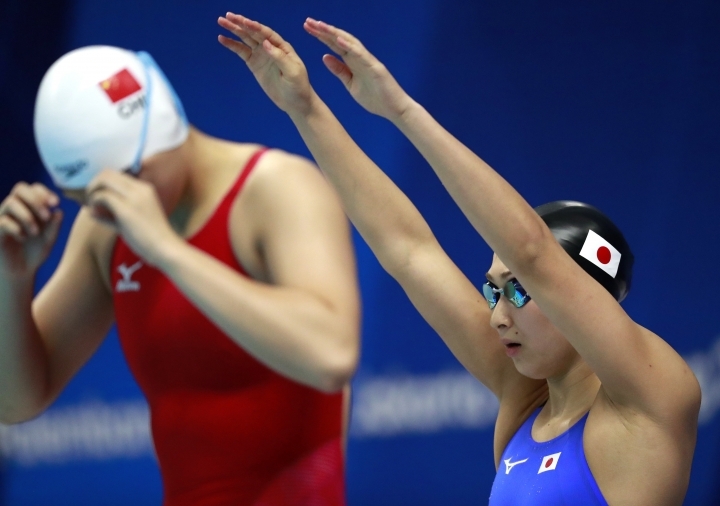 Rikako Ikee led Japan's charge by picking up her second and third gold medals with victories in the women's 50 butterfly and the 100 freestyle in games record times. "I achieved what I came to do tonight so I'm delighted," Ikee said. "The plan was to conserve energy in the first half of the race and finish strong. That's exactly what happened." Japan held on to win the men's 4x200-meter relay in a games record time to cap off the night, holding off Sun's Chinese team and a Singapore quartet led by Joseph Schooling. In the last group games in men's soccer, Tottenham forward Son Heung-min's 63rd-minute goal gave South Korea a 1-0 win over Kyrgyzstan and set up a last 16 game against Iran, the other four-time champion. Chinese gymnast Lin Chaopan won the men's individual all-around title, with Chinese teammate and world champion Xiao Ruoteng settling for bronze. In the biggest upset of the day, seven-time kabaddi champion India was edged 24-23 by South Korea — its first ever loss in the sport at the Asian Games. Local organizers have been dealing with ticket and transport confusion and the scandal over four Japanese basketball players sent home, among other things. 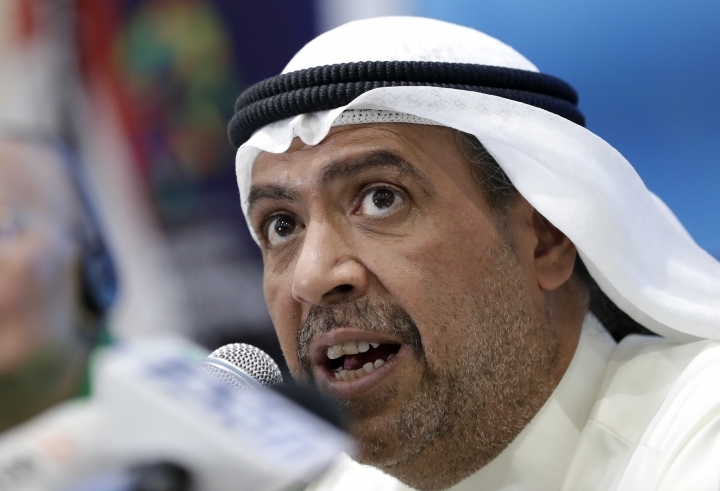 For Olympic Council of Asia President Sheikh Ahmad Al-Fahad Al-Sabah, questions at a news conference about a catalog of concerns became an opportunity to present his positive spin. He said the opening ceremony had been the best ever staged in the region and its success inspired a flood of interest in the games. And that, the Kuwaiti royal said, was why the ticket system became overwhelmed and why there were problems with shuttle buses. The morning started with the Japan Olympic Committee confirming four basketball players had been suspended and sent home after media reports alleging the involvement of prostitutes while the players had been on a night out last week and wearing team clothes. Sheikh Ahmad commended the Japanese delegation for acting swiftly to deal with the matter. "Athletes should be the good symbol of their society," he said. "To represent the country is not only to stand with the medal. It's how you behave with the other athletes, the officials ... volunteers — give a good example." Host Indonesia started the day well by earning gold medals in mountain biking downhill events. And China continued to extend its lead in the medal standings with three of the four gold medals awarded on the second day of the shooting competition. Yang Kun-pi of Taiwan equaled a world record to win the other shooting gold, scoring 48 points in the men's trap. 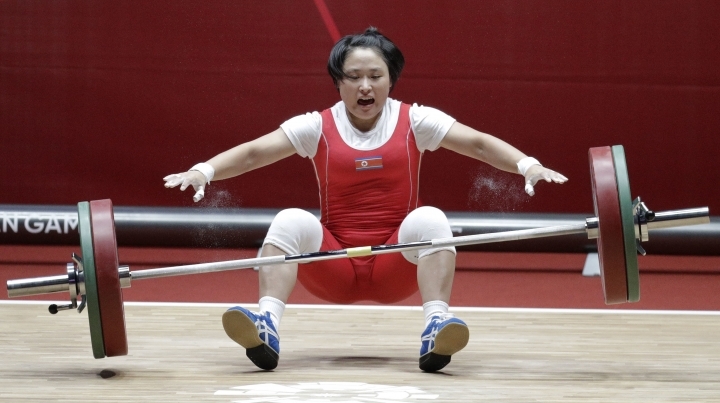 In other notable results among 29 finals Monday, weightlifter Ri Song Gum won North Korea's first gold medal of the games with victory in the women's 48-kilogram division. 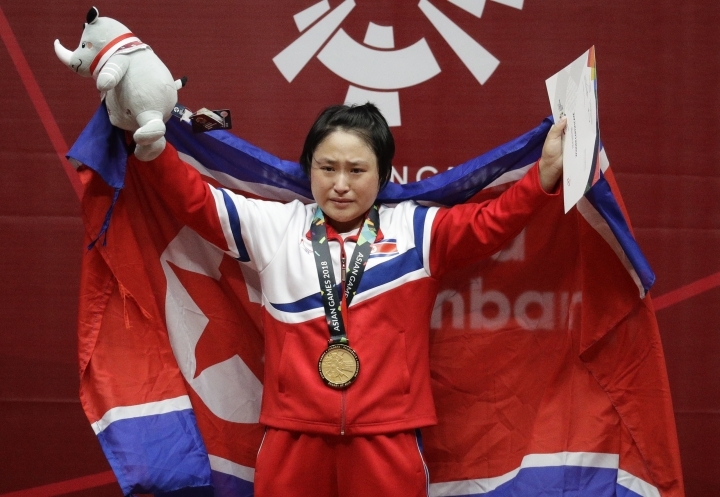 North Korea added gold medals in the 53- and 57-kilogram women's wrestling divisions after Vinesh Phogat became the first female wrestler from India to win an Asian Games title when she beat Yuki Irie of Japan in the 50-kilogram class. China was leading the medal standings with 15 gold medals, seven more than Japan.